Life as a fisherman has skewed my relationship with time. Some folks live off the grid; we live off the calendar. Twenty-four years of following Southeast Alaskan fisheries has resulted in a seasonal dissonance that is never more evident than in December. My attitude toward Christmas is more Tim Minchin than traditional, and I drift through “The Holidays” feeling vaguely disconnected from my cultural surroundings. In my world, Christmas Eve is June 31, not December 24. Our July 1 king salmon opening delivers all the breathless possibilities – glossy-eyed optimism to devastating disappointment – of other people’s Christmas. The 2:45 alarm will blare all too soon, so Cap’n J and I force ourselves to our bunk early, as the sun still hovers high above the horizon, retiring to visions not of sugar plums but big chinooks dancing in our heads. Did we pick the right tiny spot of a vast coastline? Will we get lucky? After a restless night, we leap out of the bunk, throw the hooks in, and wait, stomachs knotted, to see what we’ll get. The New Year’s Eve/Day hoopla is even more confusing. My sense of each year’s beginning/ending comes from Up North springs and Down South autumns, a bi-annual migration that provides the punctuation to my life. A random date in the midst of winter – our “off” season – means nothing. I suspect teachers experience something similar, synchronizing their inner timelines with the school year. One December holiday resonates with this seasonal lifestyle: Solstice. The shortest day of the year presents an opportunity to pause, reflect on the passage of winter, and welcome the returning of the light. Long days are critical to our livelihood: when you only have a few months to make your year’s income, every moment counts. Winter Solstice offers a bookmark-like quality to our off-season, a reminder that we’re now moving towards its summer counterpart and our northbound migration. As the sun sets on 2011, I want to thank you for being a part of Hooked’s community. Getting to know you through your comments has been a joy and an inspiration, and I’m eager for what 2012 will bring. However you identify with this time of year, my best wishes of warmth, gratitude, and miscellaneous holiday cheer to you and yours. Friends of salmon and wild places: have you written your letter for the Tongass National Forest yet? As discussed in Protecting the Tongass, Part 1, the U.S. Forest Service’s budget for the Tongass has long been skewed. Timber/road development currently receive annual funding of $25 million, while habitat conservation/watershed restoration receive $1.5 million. This disparity concerns me. As a commercial fisherman, I have a significant interest in protecting the delicate ecosystems that nurture salmon. And as someone who calls Southeast Alaska “home,” my identity is as rooted in the Tongass as the towering hemlock, spruce, and cedar that carpet our coastline. With gratitude to author/photographer Lynn Schooler for sharing this photo. 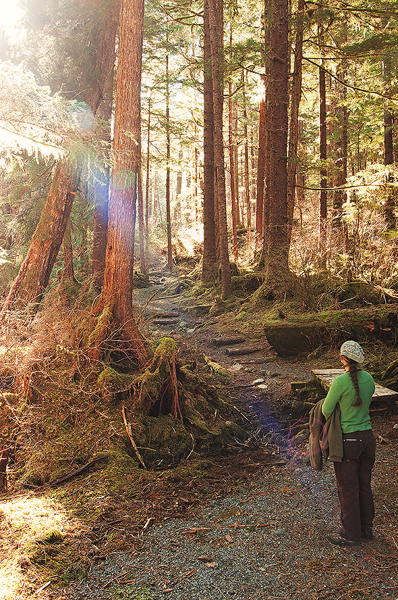 Sitka Conservation Society is a longtime advocate for a more balanced forestry budget. I’m joining SCS in this effort, and invite you to do so, too. Our goal is to collect 200 letters requesting increased funding for restoration and salmon protection by February 1. Can you take a moment to share your support? In February, SCS will hand-deliver our combined messages to Washington D.C.; please email your letter to andrew@sitkawild.org. My name is Tele Aadsen, and I’m a second-generation salmon troller in Southeast Alaska. Salmon trollers are predominantly family operations; I began fishing at the age of seven, in 1984. My mother was one of a handful of female skippers at that time, and we comprised the only all-female troller. For the past 7 years my partner and I have run our own boat, the 43-foot Nerka, which he grew up on and took over as a 22 year old. Hook-and-line caught, we process and freeze our catch at sea, marketing a premium quality wild salmon to restaurants, grocers, and food co-ops across the U.S. This is our sole source of income. Discussion of salmon sustainability frequently focuses on fisheries management and healthy oceans. Essential elements, yet incomplete. We must devote equal attention to the surrounding forests, which provide critical salmon habitat. In its streams, lakes, and ponds, the Tongass National Forest provides 17,690 miles of salmon habitat. Salmon are inextricably linked with the Tongass; the well-being of one directly impacts the other. In Alaska, salmon mean far more than a meal or a paycheck. 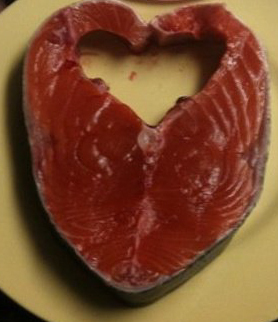 In a 2007 survey, 96% of Alaskans said salmon are essential to our way of life. In our remote region, where many communities are island-based, closed systems, the term “way of life” refers more to practical necessity than sentimentality. Nearly 90% of rural households in Southeast Alaska depend on salmon. What does a dependency on salmon look like? It looks like over 7000 jobs: men, women, and young people working on fishing vessels or in processing plants. In a tremendous ripple effect, fisheries contribute to local economies. In some of Southeast Alaska’s small communities, salmon are the local economy. Grocers, restaurants, hotels, cold storages and transport systems all flourish with healthy salmon runs. The combined economic value of commercial, sports, and subsistence salmon fishing, plus hatchery operations, is estimated at $986.1 million. The economic impact of salmon doesn’t stop at Alaska’s border. 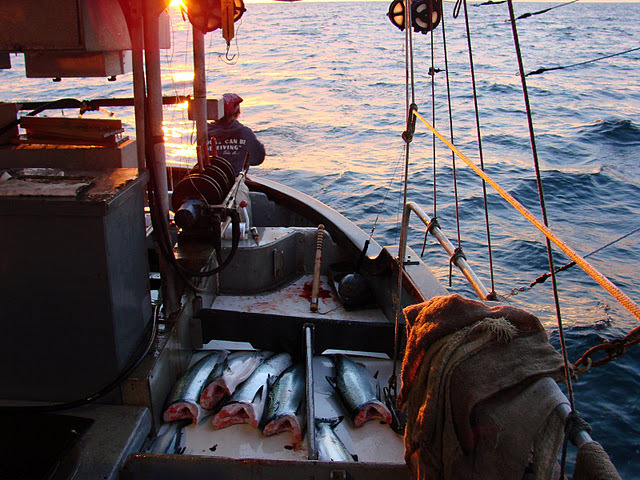 Many fishermen spend the off-season in the Lower 48, enhancing the economy of multiple states. In 2009, my partner and I were able to purchase our first home in Washington, where we frequently have boat work done. Maintaining a safe, successful fishing vessel is an expensive, on-going effort: all across the West Coast, harbors, boat yards, diesel mechanics, refrigeration services, craftsmen, fiberglass workers, metal fabricators, gear stores, and other marine service professionals are direct beneficiaries of our good salmon seasons. Beyond these enormous economic considerations, the Tongass is one of the few remaining wild places in America, a rare ecosystem of deep cultural significance, beauty and wonder. I’m profoundly grateful for my life as a commercial fisherman, and hope to continue providing quality wild salmon to Americans in a responsible manner. I’m committed to protecting the natural resources that allow this unique profession, and want to thank you both for joining me in this effort. Thank you for advocating for a healthy, sustainable future, prioritizing funding for watershed restoration and salmon habitat in the Tongass. Please take a moment to write a letter voicing your support for a more balanced forestry budget. Your message doesn’t have to be long, but Sitka Conservation Society does need it by February 1 for hand-delivery to Washington D.C. In addition to channeling letters through andrew@sitkawild.org, you can, of course, send additional messages directly to Alaskan Senators Murkowski and Begich Forest Service Chief Tidwell (ttidwell@fs.fed.us), and Undersecretary Sherman (harris.sherman@usda.gov). To me, these letters are more than advocacy. We’re writing love letters to the Tongass, based on our unique relationships with trees, salmon and Southeast Alaska. You all know my story… I’d love to hear yours. Why do you want to protect the Tongass? Please copy/paste your letter in the comments below. I’ll keep you posted on how we’re doing with our 200 letter goal. As always, I’m deeply grateful to each of you for your time and support. Best wishes to all. Again, gratitude to Lynn Schooler. This photo was taken in Sitka, but could be almost anywhere in Southeast Alaska. 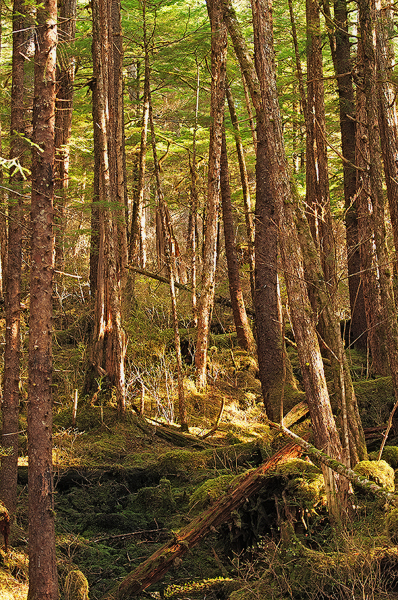 The Tongass National Forest blankets most of our region, a crazy quilt of western red cedar, Sitka spruce, and western hemlock that covers almost 17 million acres. Not only is the Tongass the largest national forest in the US, it’s also the largest temperate rainforest remaining in the world. About 70,000 people call the Tongass home – as do 30,000 bears. This rare ecosystem also supports deer, wolves, over 300 species of birds, and all 5 species of salmon: chinook, coho, sockeye, chum, and pink. When we talk about protecting wild salmon, our national dialogue is heavy on fisheries management and healthy oceans. Essential elements, but incomplete. These ocean swimmers begin and end their lives in freshwater, including 17,690 miles of streams, lakes and ponds in the Tongass. If we promote sustainable fisheries without placing equal value on salmon habitat, both are at risk. One of my fellow fishermen, Karl Jordan, published an editorial in the Juneau Empire yesterday: “Forest Service Budget Just Doesn’t Add Up.” (Available here.) Karl examined the annual funding for habitat conservation/restoration ($1.5 million) and logging/road development ($25 million). Quite a discrepancy – especially when you note that timber-related jobs number less than 200, compared to over 7000 fisheries-related jobs. A fourth-generation fisherman, Karl’s profiled here in Amy Gulick’s tribute to the Tongass, Salmon in the Trees. He’s a powerful advocate for salmon, speaking from a place of deep love for Southeast Alaska, the Tongass, and commercial fishing. That’s the place that I speak from, too. Life as a harvester is, for me, inherently bound to life as a conservationist. I believe it’s my responsibility to protect what I love. And between the photo at the top of this post, the many joys of our life at sea, and the honor of hand-delivering these gorgeous fish to our customers, I can’t even begin to count all of the ways I love salmon and trees. If you speak from this place, too, please join me in quick, easy activism for salmon. If you support increased funding for salmon programs and habitat restoration in the Tongass, please email Forest Service Chief Tom Tidwell (ttidwell@fs.fed.us) with your message. It doesn’t have to be long, but it does have to be received by December 16th to weigh in on 2012’s budget planning. Not sure what to say? Karl’s editorial, here, is a great resource. Tomorrow, I’ll share a copy of my letter to Undersecretary Harris Sherman, which you’re also welcome to use as a resource. Whether your livelihood depends on the well-being of the Tongass, or your life is richer knowing that wild places like this still exist in our world, thank you for joining me in this effort. Writer of the Month? Thanks, Red Wheelbarrow! As much (and as loudly) as I grieve our autumn migration, leaving our Sitka family for the winter, it doesn’t take long before I remember that this transient lifestyle brings the best of several worlds into my life. Our winter-life offers luxuries like regular showers, personal space, and access to Thai food. But one of the biggest blessings has been the opportunity to participate with Bellingham’s Red Wheelbarrow Writers (RWB). 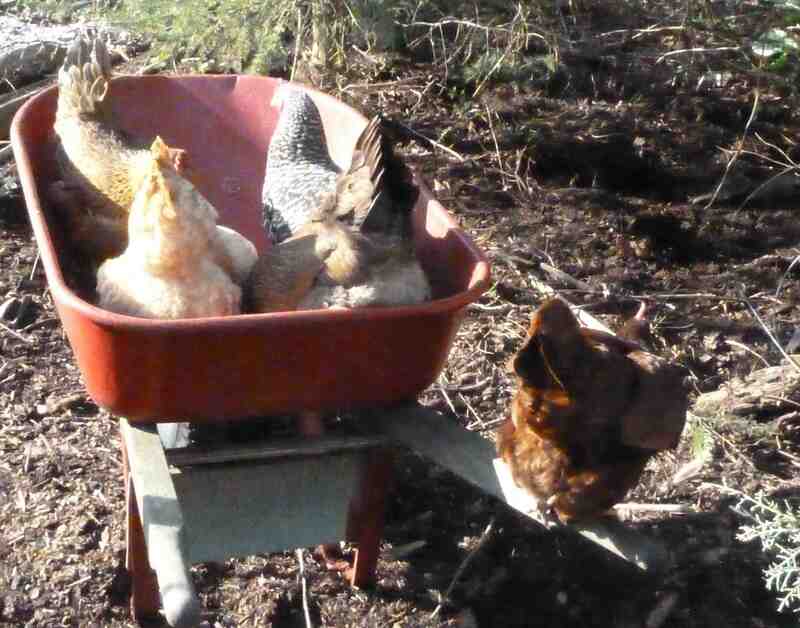 If you’re a writer who’s even remotely within the Seattle – Vancouver BC I-5 corridor, I strongly recommend keeping an eye on Red Wheelbarrow opportunities. (They’ve got a FB page here – “like” them to get the latest event updates.) They’ve offered some of the best writing workshops I’ve attended (how to write a query letter, non-fiction proposals, and building platform) and always have stellar speakers. Beyond classes, RWB fosters a vibrant, inspiring writing community. The first Saturday of every month is Happy Hour – an opportunity to share your work with a joyfully supportive crowd. These are the folks I spent years longing for. When you feel a dizzying affection for someone – or, in this case, a group of someones – there’s nothing better than learning they like you back. So when author and RWB co-founder Cami Ostman invited me to be their December writer of the month, I was honored. A little intimidated, too. How to articulate my writing process for others, when I spend so much time questioning it, for myself? How to publicly proclaim an identity that, in truth, is still a very new journey – exhilarating at times, terrifying at others? The interview is available here. This is a new feature for RWB (author Jennifer Wilke kicked off the series in November) so please check back for future profiles of our talented members. Many thanks, RWB, for this and all of the other opportunities you’ve shared!